I used my good camera w/ directional microphone, and set up the scooter frame so that it would resonate. The difference is pretty clear here. Everything you hear translates to what you would feel while riding it, so the ride will be much smoother as well. These days, most people are surprised when I tell them that my background is in mechanical engineering, not electrical, since more often then not I am troubleshooting some circuit or winding a giant inductor or something. But probably the thing that nobody knows is that my real background is in software. Okay, not in the educational sense, but I've been programming things since I was like...ten. I won't make any claims about my actual skill, but I will say that on more than one occasion I have been saved by a bit of software fidgeting that I probably couldn't have done if I hadn't been writing all those games (e.g. Pokemon Hunter and Pokemon Hunter II) when I was too little to use power tools. In one of the saddest tragedies of my life, the original source code for Pokemon Hunter (written in QBASIC!) has been lost forever, but I assure you the graphics looked roughly like this. First was the double-stack IRFB3077-based controller (right), my very first shot at three-phase brushless motor control. While it has the distinction of MOSFETs so powerful they caused the aluminum bus bars to desolder themselves (Yes, you can solder aluminum. ), it was impractically large for the scooter because each one only controlled one motor. 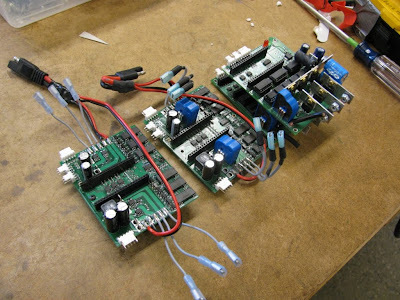 Next was the greatly compacted 3ph Duo, so named because it controlled two motors from a single board using two IXYS GWM 100-01X1 six-pack MOSFET bridges as the inverter stages. And it works. But as I described in the last post, that won't stop me from making yet another one. The most obvious visible change is the lack of LEM current sensors. These were large and expensive and have been replaced by the ACS714 surface-mount sensors, two each per motor. Two each so that I can effectively measure three-phase currents, instead of assuming that only two phases conduct current at a given time. If you want to know more about why I am concerned with this, this post sort-of sums it up. The goal is to implement full sine wave commutation with the possibility of phase adjustment, something that would separate this controller from other similarly sized and priced small vehicle brushless motor controllers on the market. Turns out from a hardware standpoint, this is very easy. The microcontroller I use, the TI MSP430F2274 already has six independent PWM output channels (three per motor). So the circuit board is essentially the same, with a few signals re-routed to make room for the six PWM pins. The PWM outputs, normalized to the DC (battery) voltage, for full-command (top) and half-command (bottom). In both cases, they are centered at half the battery voltage. The modified drive signals at full-command (top) and half-command (bottom). 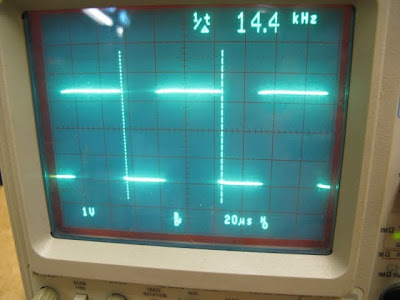 This signal is high when the processor is in a PWM interrupt executing the above block of code. Of that, roughly half of the time is spent just doing the six multiplications. There are tricks for fast software multiplication, but only if one of the operands is known a priori (not the case here). The sine table look-ups, as fast as they are, also take up some time. The adds and shifts are relatively small contributions. Amazingly, though, this actually works. Try getting your computer to do anything when its processor is being utilized by background processes 60% of the time. (Okay, dual core...I know...) But this can still execute a slow loop with control and data acquisition functions and read in more interrupts from the hall-effect sensors. It's still a little quirky, but it didn't collapse in a mess of horrible interrupt stack Jenga blocks like I thought it might. Yep, finally ran out of program memory. And I sure as hell am not going to buy the $N,000 full version of IAR Embedded Workbench. For the record, no compiler is worth that much money. It's not like Solidworks or some specialized simulation program that costs a lot of money to develop. It's a f*cking compiler. It takes C code and makes assembly code based on a set of well-understood standards. Even if I were using it for a commercially, it would be more worth my time to get a free GCC compiler and learn how to use Eclipse. Screw you, IAR. But I love your free version. :) So I will just have to keep my code size down. Now might be a good time to step back and ask what the heck I am doing. Optimizing this one timy bit of code is a long way from making a new sine-commutated motor controller, and I have a long way to go before I can say I've finished the latter. But with the sine wave generator running at 15kHz in the background, all that's really left is to integrate the Hall effect sensors and some sort of master control loop. The Hall effect sensors are really easy...dare I say easier than they are with the normal six-step commutation scheme where they drive a state machine. When a sensor hit comes in, you abandon whatever position you were at before and jump to the "correct" place in the sine table. "Correct" is tricky, and this is where a phase offset can be added in. But for now, I will rely on the scooter's moveable Hall sensors to make this work. The other piece of the puzzle is to set the speed of advance through the sine table, aspeed and uspeed in the code above. This is done by (carefully) estimating the time of one electrical cycle, which is six Hall effect transitions or in this case 1/7th of a revolution. I say carefully because this breaks down at low speed and also can be "glitchy". So there is more software work to be done here. Lastly, the master control loop. This is where the high-level implementation happens. Eventually, this will hopefully measure and control both the quadrature- and the direct-axis current. 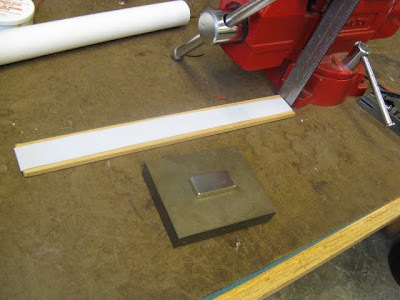 The quadrature-axis current is the current that actually pulls on the magnets, creating torque. 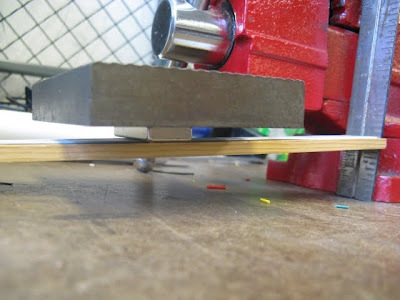 The direct-axis current can be used to change the torque-speed curve by countering the magnets, but I doubt this will make much difference for the scooter motors. Anyway, there is still some work to be done before this method of control is fully functional. For now, it is easy enough to create something that works by just controlling some semi-arbitrary current measurement, or even just running it open loop. This is where I am now...testing the subsystems to make sure they are working reliably before I integrate everything in the master loop. I promise I will do a better job capturing the results in a future update. That is, assuming I don't go crazy from debugging software. It's usually not my favorite thing to do. There's some fun in squeezing every last drop of computational power out of this thing, but I would still rather be making something tangible. Although in the end that's what this is for, so that's one plus. And if things go downhill, the old controller worked perfectly fine. Which...hrm...why am I doing this again? I also promise a massive technical write-up for anyone who is interested in how this thing actually works. Ha...funny...nobody cares about controller. But there will be a write-up nonetheless. Recently, many of the projects I've been working on have been for credit, or for a class, or continuations of my never-ending quest to build a better motor controller. Speaking of which, the newest implementation is showing promising results. Except for the fact that I ordered some incorrect components, it went together perfectly and, without giving away the big reveal, is quietly proving that sine wave control of standard hall effect sensor brushless motors is ... easy. Right, Failbot. I've been thinking that my projects have become a bit too large in scope and slow in execution. I say that being a grad student has basically slowed my pace down by a factor of two, since for every hour I spend actually doing something, I now have to spend another hour wondering if it's the right way to do it, what the potential problems are, and how to do it more efficiently in the future. So I am taking on this mini-project as an admission of my declining ability to just do something without thinking it through from beginning to end. In fact, every time I stop to think about Failbot, I realize how likely it is to not work at all. Solution: stop thinking about it! So assuming I don't get arrested or have my account suspended, I get a $60 controller that might be capable of reversible speed control. If you wonder why I make controllers from scratch, this is why. But in this case I would rather try my luck with the RC stuff. If it works, it will save me a lot of time and will be 2.007 hardware-compatible. Like my last little robot...minus the high-speed acrylic-shattering collisions. Maybe some MechEs will look at it and be inspired...to use wheels instead. In case you've never seen what an arrow going through fruit looks like in 333x slow motion. These videos were shot with a Phantom high speed video camera in the Edgerton Center Strobe Lab during a freshman seminar. The lighting came out very well, even at 10,000 frames per second. Everyone's favorite seems to be the one where the arrow misses, taking out the cups but leaving the fruits hanging in mid-air. Newton's first and second law in action. Divide the file size in bytes by (512x256). Take the remainder. Subtract that number of bytes from the file using a hex editor. This is the header. A wonderful little tag "mdat" (movie data?) at the exact address of the remainder. I love raw video! Compression is for losers.